Organizations are readily harnessing the advantages of cloud-hosted models for critical applications. In fact, 81% of IT leaders are using or are planning to leverage the cloud for these business-centric apps in the next two years. But while the benefits of the cloud can be applied to even the most complex legacy application, the ROI to the business, the technical implications, and the performance impact must be fully understood before making a final decision to migrate it to the cloud. 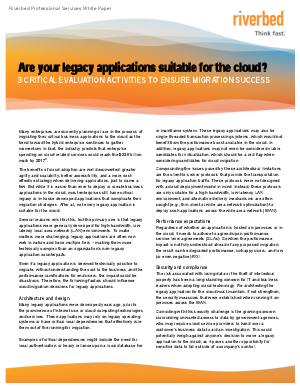 Read this white paper to learn 3 critical legacy application evaluation activities to ensure cloud migration success.